After all the rich holiday-season meals, I have a craving for something light, fresh and healthy. But not only that. Tasty, too. Spinach Arugula Salad has been my favorite salad for the past couple of months. 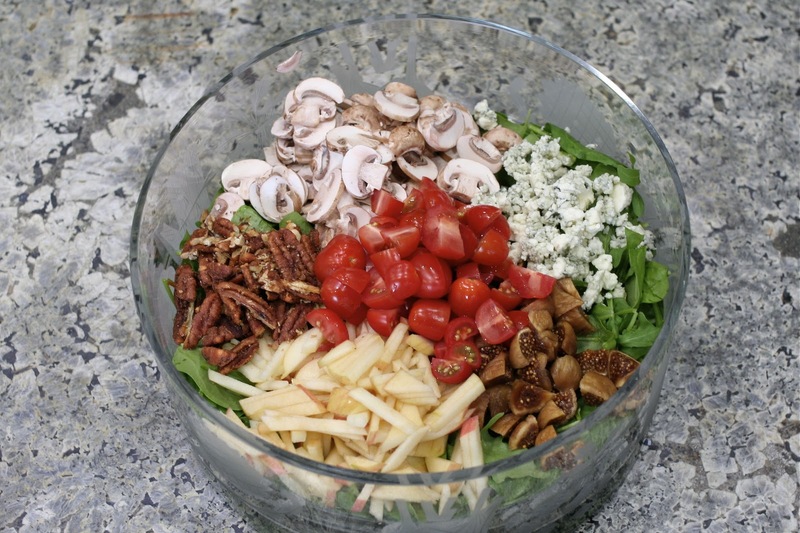 During the holiday-season, I took this salad to just about every pot-luck and party I attended with great results. And when I served it at home to Rick and his girlfriend, Jessica, she went home and made it for her family! 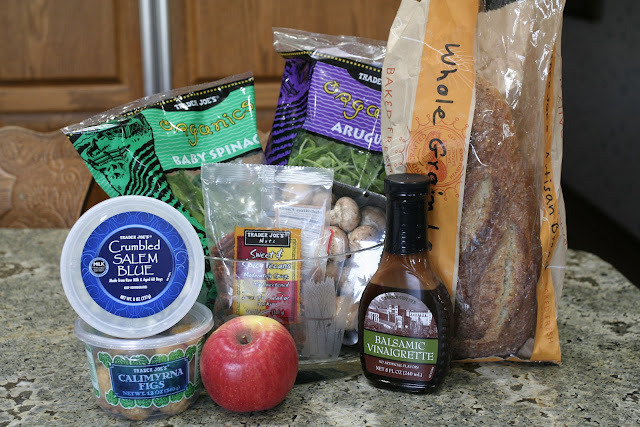 I bought everything for the basic salad at Trader Joe's, so it's a one-stop, last-minute, pick-up-something-for-dinner, shopper's delight! 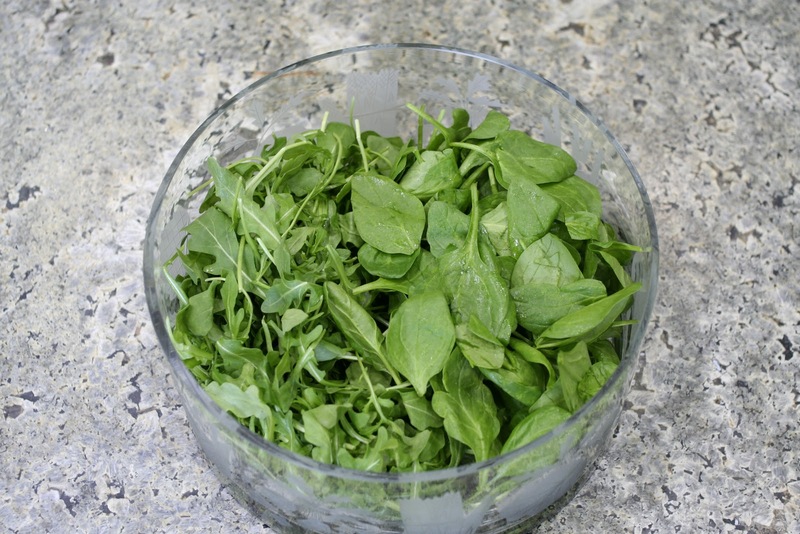 For the two of us for dinner tonight, I used half a bag of the arugula and spinach. And half a Fuji (the best!) apple. Slice the apple in half, then slice in one direction. 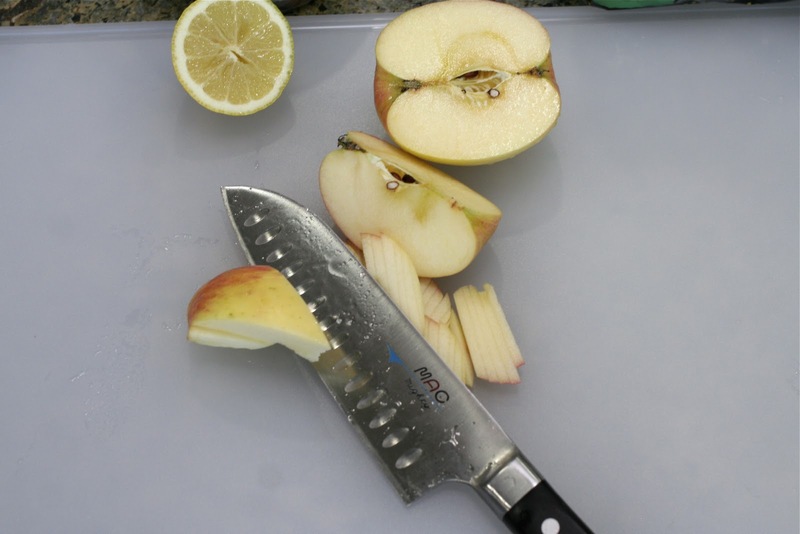 Stack the slices up and slice in the other direction to julienne. 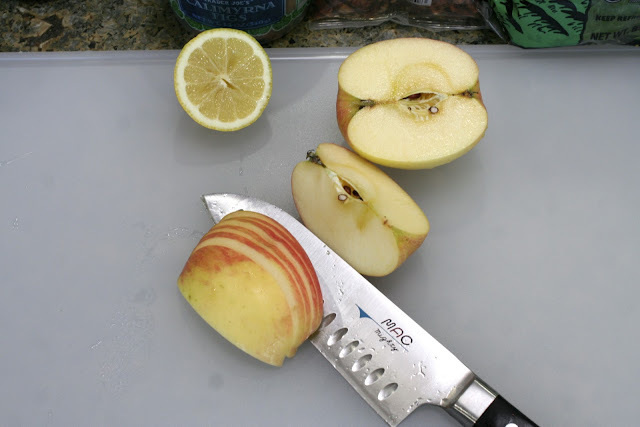 You can mix the apple pieces with a few drops of lemon juice to keep them from turning brown. Slice the mushrooms. I used about half the container. I like them sliced relatively thin for this salad. This is one of my new-found Delicious Delights. Dried Calimyrna Figs. Okay, wait. 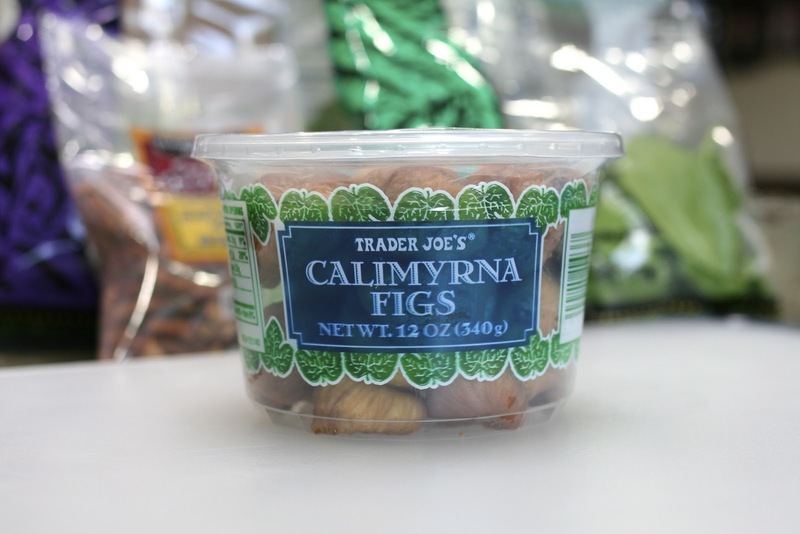 Some of you might be getting a little...apprehensive...right now with these figs. Trust me. They are so tasty! You might be thinking Fig Newtons, but seriously, these are so good! First thing you need to do is cut off the hard tip of the fig. 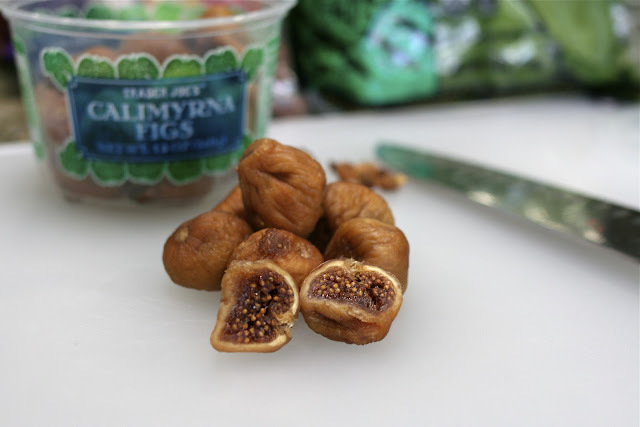 Trader Joe's also has Black Mission Figs and Turkish Smyrna Figs. Don't get those. They're not as good. The Black Mission Figs are pretty good, they're sweet & dark, like raisins. The Turkish Smyrna Figs are too dry for me. 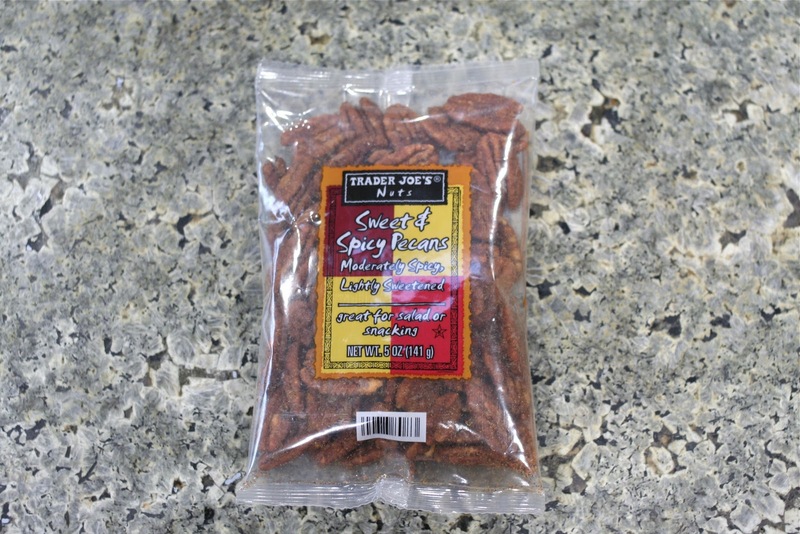 Although the cashier at Trader Joe's said they were his favorites, so I guess it's all a matter of taste. 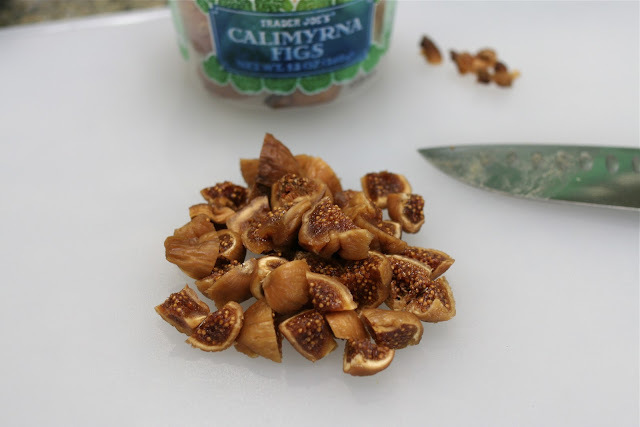 Cut the Calimyrna Figs into quarters. Just big enough to get a good blast-of-flavor bite. 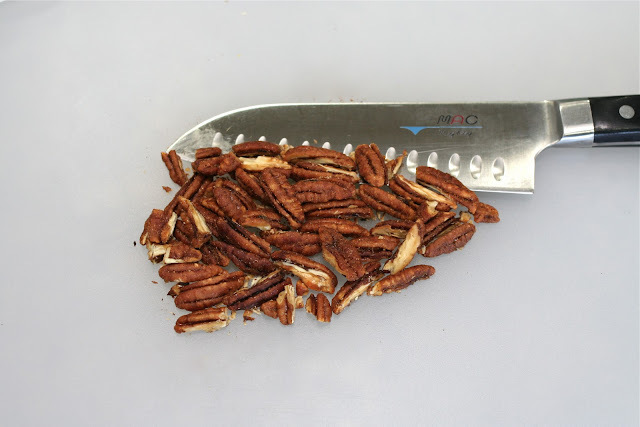 These Sweet & Spicy Pecans need to go on the Delicious Delights page too! Cut them in half, lengthwise. Try not to eat the whole bag (it's a tiny bag!) 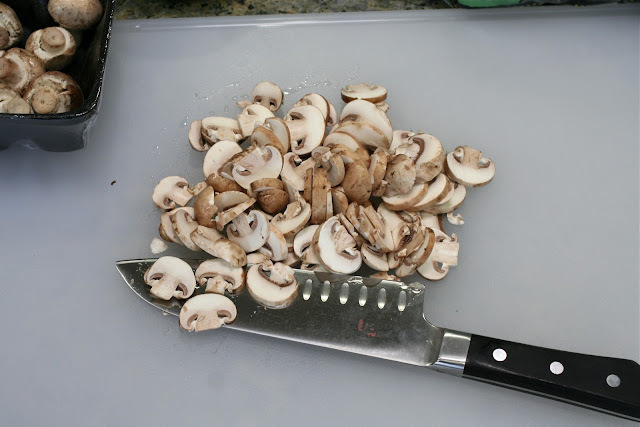 before you finish cutting them up. I used about a third of the bag for this salad. I had some grape tomatoes, so I added them for color. And juiciness. This is the salad I took to the holiday parties and pot-lucks. Drizzle a little bit of the salad dressing, it doesn't need much, so go lightly on the dressing. If you put too much, you can't taste the separate flavors, and the salad will lose it's fresh taste. For this much salad, try one tablespoon first, then add more if needed. 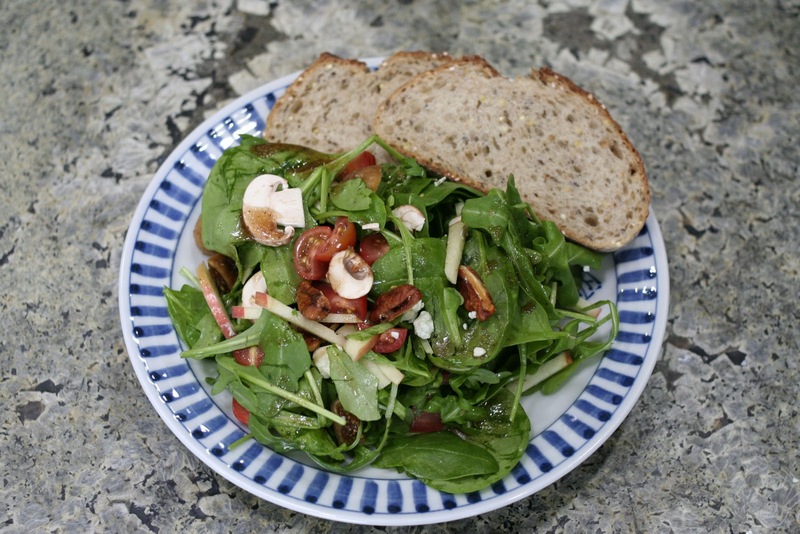 The Spinach Arugula Salad, shown with some crusty whole grain bread. 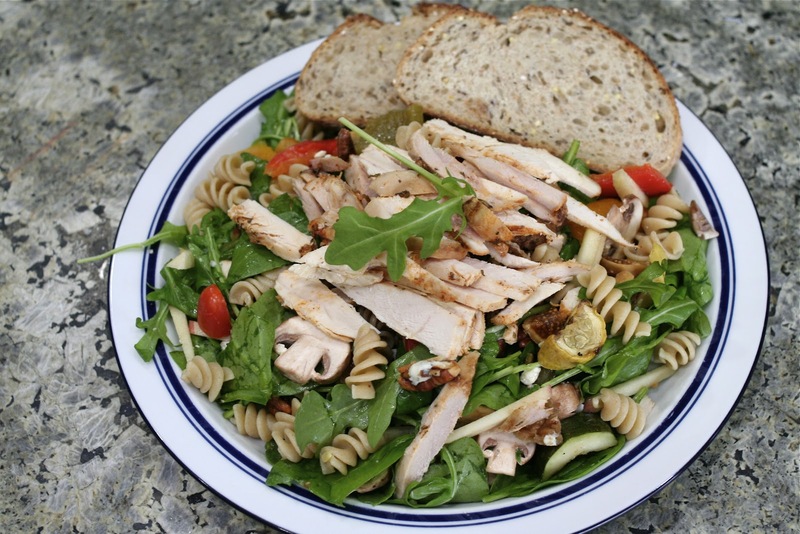 Add some leftovers--whatever you have on hand--to make it into a main dish salad. 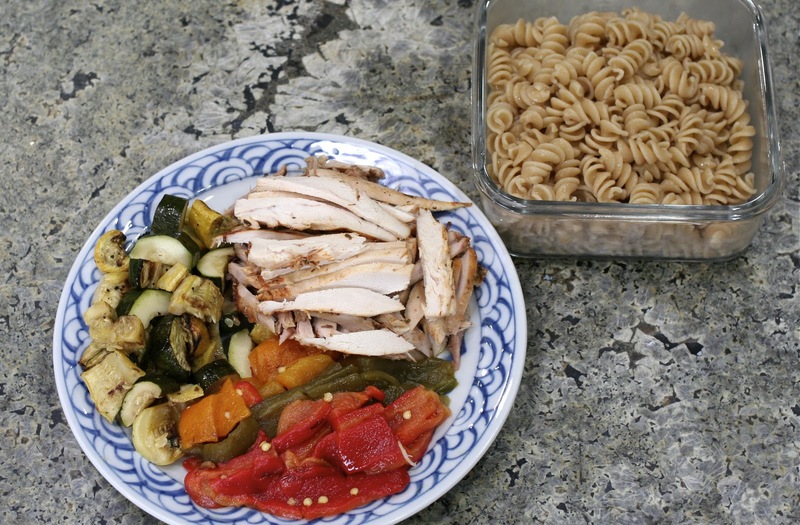 Grilled squash, roasted assorted peppers, sliced baked chicken, and whole wheat rotelle pasta are the leftovers I had in my fridge. Or, cook some up something especially for the salad. 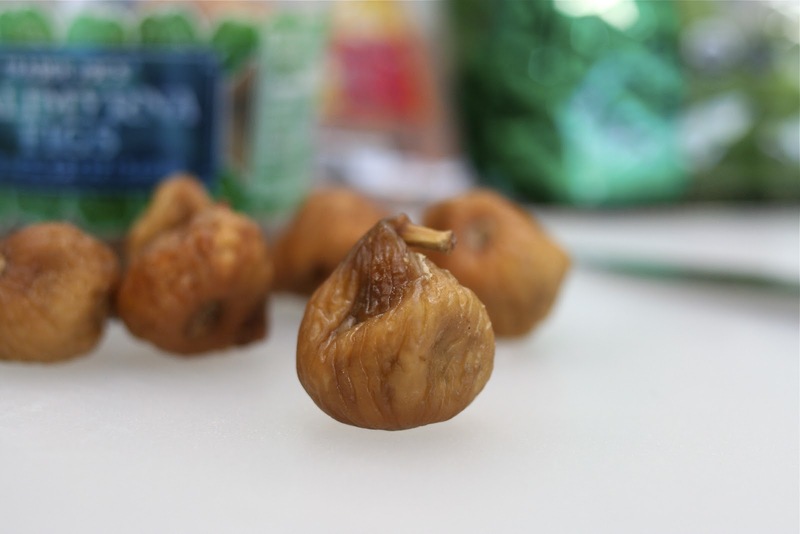 I love the photo of the fig! and your salad recipe, too, of course!! I found your website from reading the LA Times article about tastespotting.com. I love how you put your photos of the ingredients and the recipe instructions. You make it user friendly for someone like me who is a beginner cook. Also it's nice to read a blog from the Los Angeles area. Many blogs that I read are from out of state. Thanks again for sharing your recipes. I look forward to making your dishes.